Moringa Oleifera: Each Capsule contains 100% Organic ground Moringa Oleifera leaves. Summary: Moringa Oleifera, also known as the drumstick tree, is a tree that grows in the foothills of the Himalayas in northern India. It is also cultivated throughout Central and South America and Africa due to the ease with which it grows in tropical and sub-tropical environments. 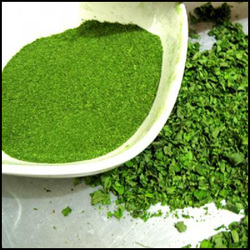 While Moringa remains relatively unknown in the West, it has developed a reputation in its native lands for its unusually high nutritional value. Health researchers have started to give it nicknames such as "The Miracle Tree" and "The Elixir of Long Life" due to its miraculous healing abilities. Moringa Oleifera Benefits: Just some of the benefits of this tree's leaves are: Anti inflammatory support, promotes healthy digestion, helps with mental clarity, regulates healthy blood glucose levels promotes circulation, contains 7x the vitamin C found in oranges, 4x the calcium in milk, 4x the vitamin A in carrots, 2x the protein of yogurt, 25x the iron in spinach, and 3x the potassium in bananas.